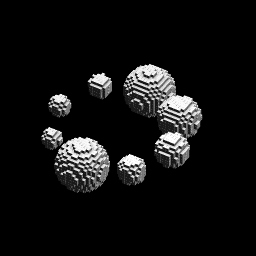 In this post I introduce a new experimental feature I am adding to goxel: procedural voxel generation. For this I created a mini language specifically designed to describe drawing operations. Think of it as the logo language, but in 3D. Note: this is still experimental at this point, so anything in the language could change in the future. I will try to keep this page up to date as a reference documentation. 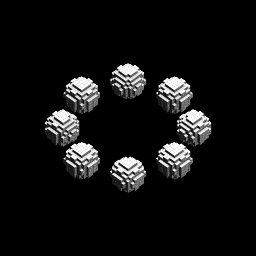 To try it out, you need to get the last version of goxel from the github page, then use the 'procedural' tool, enter the code, and press 'run'. You can use 'auto run' to automatically re-run the code anytime it changes. The language is largely inspired by ContextFree language. I tried to keep it as close as possible. 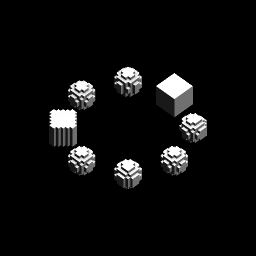 shape main is the entry point of the program and cube is the command used to render a cube. 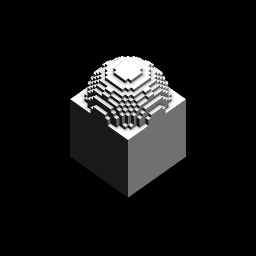 This program renders a 1x1x1 voxel on the screen. To make it bigger we can put adjustments inside the square brackets. Here s 9 tells the program to make the cube 9 times bigger (s is for 'scale'). If we wanted to scale the cube differently in x y and z we could have used the s adjustment with three arguments: cube[s 3 4 5]. Since it is common to only scale along a single axis, we can also use sx, sy and sz. For the second cube we use two adjustments applied one after the other: s 9 to scale the cube, followed by x 2 to translate it by 2 times its size. 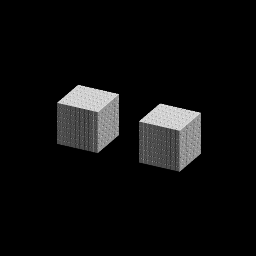 The adjustments are applied in order, and not commutative, so [s 9 x 2] is different from [x 2 s 9], in the first case the cube is translated by 9 voxels, in the second case only by 1. Note the syntax of the adjustments: any values following an adjustment operation until the next operation is an argument to that operation. 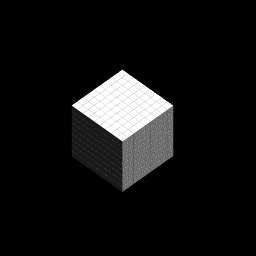 // Render a cube with a sphere on top. 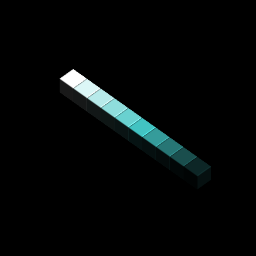 We render the new shape just like we did for a cube. The adjustments we use in the call are applied before the shape is rendered, so in that case we render the new shape scaled 20 times. The way to understand it is that the execution of the code is linked to a context. The context define the position, size and color we are using. When we call a new shape, we duplicate the value of the current context and apply the adjustments to it before rendering the shape. It does not affect the rest of the rendering of the caller. 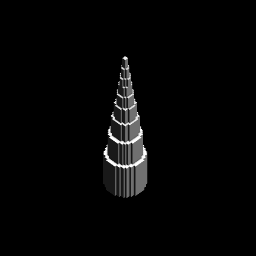 The recursion is automatically stopped when the shape becomes too small. 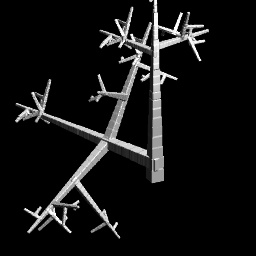 This will execute the block 8 times, each time with a context rotated 45° compared to the previous one. The adjustment only affect the block of the loop. // have a random size between 4 and 16. In this example, my_shape is most of the time a shere, but sometime a cube. The weight give the relative probabilities to use a given rule, here 4/5 chances to use the first rule, and 1/5 chance to use the second. We also see something new here: the [antialiased 1 seed 4] line apply some adjustment to the current context: antialiased 1 improves the rendering with marching cube algorithm, and seed 4 set the initial seed for the internal random function. In this example we could just have put those adjustments in the call to test. The life 40 adjustment is here to stop the recursion after 40 iterations. So far all the example used white color. Let see how to change that. The color can be changed using three adjustment: light, hue and saturation, following the HSL color model. 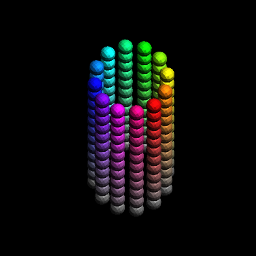 The hue varies from 0 to 360, saturation and light from 0 to 1. The initial white color corresponds to a HSL value of (0, 0, 1). There are 3 adjustments operations to change the color: hue, sat and light. Each can take one or two arguments. hue x: adds the value x to the current hue. If the value gets over 360 or below 0 a modulo is applied to put it back in the range (0, 360). light x: x in the range [-1 +1]. If x < 0, change the light value x% toward 0. If x > 0, change the light value x% toward 1.
sat x: x in the range [-1 +1]. If x < 0, change the saturation value x% toward 0. 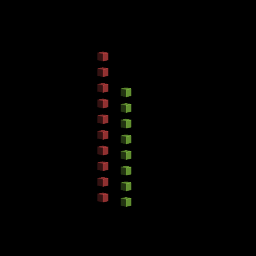 If x > 0, change the saturation value x% toward 1.
hue x h change the current hue x% toward h.
light x t change the light value x% toward t.
sat x t change the saturation value x% toward t.
The first line sets the rendering to anti-aliased and the initial saturation and light to 1 and 0.5. 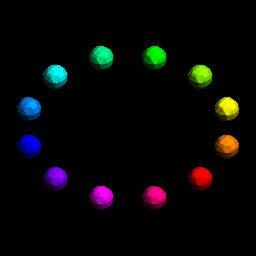 Here is a second example where we also render all the saturation values from 0 to 1. The variable $i will be explained in the next section. We can add variables to the code. All the variable names start with a '$', so that we don't mistake them for adjustment operations. We can also use variables as argument of shapes. In that case the values need to be passed when we call the shape.